Almost five months ago I turned 30. I took a good look in the mirror, literally and figuratively. I don’t have wrinkles or lines, but I certainly don’t want them! I’ve never used an eye cream and about two years ago a friend couldn’t believe it. She couldn’t believe it because she’s been using eye cream since she was 25. I knew my skin care routine needed some oooomph! oh, the list could go on! Several years ago I was at a low point with the appearance of my skin. I’d do anything to have the skin I had when I was 16/17. After college I started to experience adult acne and working in a high strung environment didn’t help, despite having a strict vegan diet. My skin reacts to dairy and soy products, especially if they’re low/poor quality products (hence having to change my diet). So I started searching the internet to find out about what I can do, aside from changing my diet. After awhile the strict vegan diet wasn’t working, so I started keeping a mainly vegan diet and brought back some fish/seafood for better protein. Learning to better manage my stress would help out, too. I was monitoring my sugar and dairy intake. I pulled my hair back each night (so my hair didn’t get all over my face) and only bought certain hair products so as not to irritate my face. I washed my pillow cases weekly (a Saturday morning ritual). I used a brand new wash cloth every day to dry my face. When I was using a Clarisonic I disinfected it every night. Finally I read about oil cleansing. It didn’t sound crazy, it made complete sense. All these years I was using a product that was trying to reduce the amount of oil on my face and my face was mass producing oil to make up for the dryness. AND it wasn’t even a natural dryness! All from chemicals! At that point I had stopped using lotion and started using coconut oil, so why not get my make-up off my face with it in the evenings and use it in the mornings to clean off and moisturize?? I started using coconut oil and noticed a difference right away. This stuff gets your make-up off better than any make-up removing wipe or cotton pad and remover ever will. I won’t give up cleansing with coconut oil each night or using apricot/avocado/almond/grape seed/hazelnut/etc. in the mornings. I then use witch hazel as the toner and skip the moisturizer because I used the oils and my skin didn’t dry out. That’s my minimal current routine. I just started using them on Sunday night. 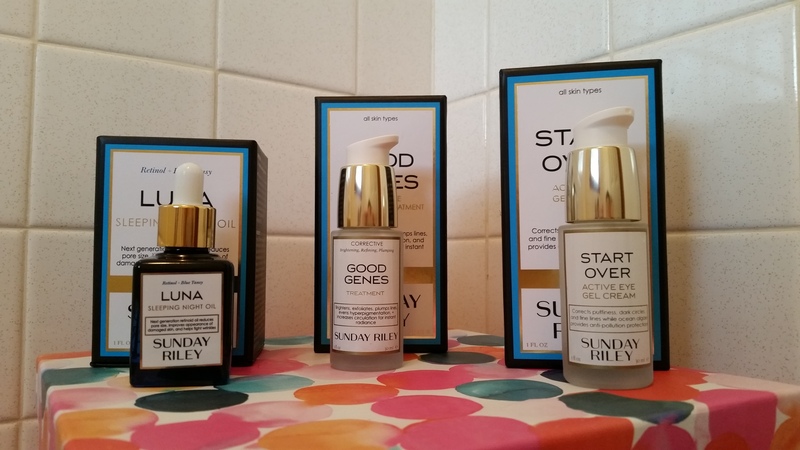 I’m alternating the Luna Oil and Good Genes, but have used the Start Over in the mornings and night time. I’m excited to see results and post a review for you guys. It’s really out of my comfort zone to have bought skin care products, but I want to step out into the unknown ocean and see what’s out there in terms of night creams and eye creams. I have no interest in changing my oil cleansing routine, but want to add to it. What’s your current routine? What is your favorite/most amazing product to date? Any warnings or recommendations?! I have heard so many great reviews about the Luna oil. I finally got a deluxe smaple size from sephora. I’m gonna try it and see if its worth the tag price. That thing ain’t cheap! I attempted to get a sample from Sephora, but every time it was offered it was unavailable by the time I placed an order. One thing I definitely noticed with the Luna Oil (and the other two products) is that the suggested amount is tooo much for my face, so see what amount works best for you!